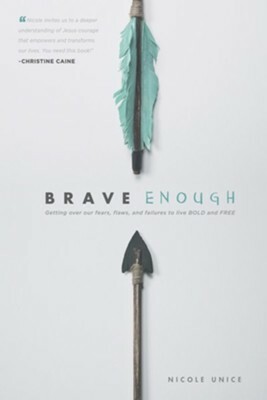 In Brave Enough, Nicole Unice explored how to tap into finding our true strength and having the courage to be brave. Most people are afraid of something and they are letting fear define their life and they aren’t living in the freedom found in Christ. This book walks readers through how to live out in courage and be brave enough to withstand in the mist of the storms in life. Throughout the book, she looks at running your race, understanding grace and giving grace, know our boundaries and live in them, not backing down in a fight, using our spiritual elements to help us in our spiritual walk, and much more. I would recommend this life changing book to every single person who is ready to live in freedom and they are sick and tired of living in fear. I loved the chapter about the four spiritual survival skills. One of the ones I really need to improve in is reading the Word of God every single day. Nicole Unice shared that it takes courage to believe when we read the Bible that God has something to speak to us through His written Word. I immensely believe in the benefit of reading the Bible and believing God will speak to us. God’s word can dramatically change our lives and it has the power to cause us to change and turn our life around. I also loved how she discussed the topic of our calling the four facets of it and how to be brave enough to pursue it. This book will enormously help readers to conquer their fears and be brave enough to live out their calling for Christ’s Kingdom. In Me Too, Jon Weece shared the importance of connecting with others and God. We all have fallen short and sinned and this is why God sent His Son to die for our sins. We all experience emotions, such as fear, anger, sadness, and pain. Many people suffer alone through difficult circumstances and they are needing a help from a friend. He strongly believes in listening to others and there is power in having a friend say, “me too”. Jon Weece shared the story about four men trying to get a paralyzed man to Jesus. They had to dig a hole through the roof in order to get the paralyzed man to Jesus’. Everyone needs friends who are willing to be there in the hard times. And the most important friend we can rely on is Jesus. I would recommend this life changing book to anyone who is longing to experience a closer relationship with God. This book has shown me that God does truly care about whatever challenges we are facing. I related with Jon when he opened up about his fears and struggles with getting close to others and opening up to them. I also struggle with trusting people and I can honestly say “me too”. This book helped me realize that I’m not alone and others have the same issues that I do. It helped me see that I need to face my fears head on and not let satan try and scare me into backing down. I also liked how Jon wasn’t afraid to talk about suicide and how it affects a large number of people. It’s heartbreaking to read it’s the “second leading cause of death for ages 10-24”. I especially liked how he shared how losing hope in life can lead to the dark tunnels of depression. He explained how satan knows how to convince people that suicide is the only answer. Jon shared how God understands our pain and He is willingly to help us. I also liked how he explored the question most people are wondering and that is, if someone commits suicide will they go to Heaven. He related the scripture of Romans 8:38-39 and this talks about how nothing can separate us from the love of God and this includes satan and his demons, our past, our future, height or depth. If you’re looking for an excellent book on ways to connect with God on a greater level, then read this book!